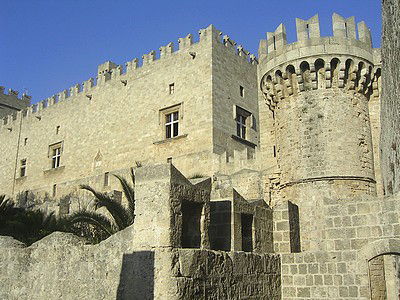 The Palace of the Grand Masters (Palati Megalou Magístrou) or Palace of the Knights, both palace and fortress built in the highest point of the medieval town, overlooking the city and harbor with its imposing mass. 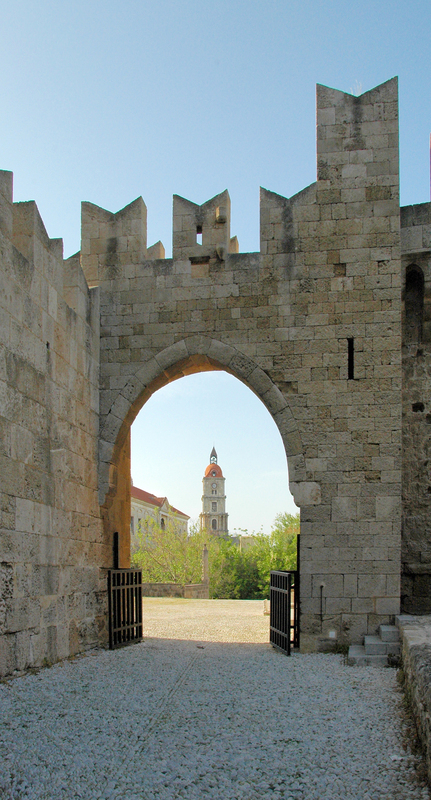 Up the Street of the Knights , after the last arch, we arrive to the square of the Palace of the Grand Masters (fourteenth century), located northwest of Collachium . The Palace, built in the fourteenth century to the northwest corner of the ramparts reinforced that looks more like a fortress than a palace, and well deserves its name of "Castello". 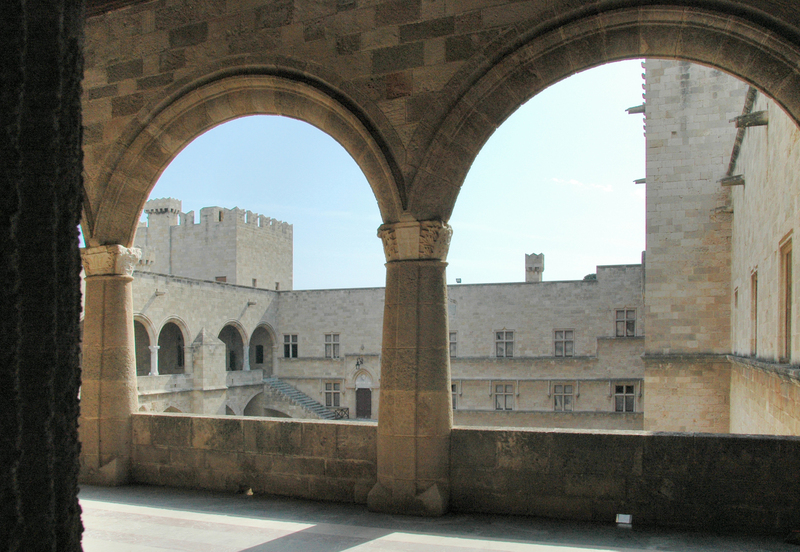 Its architecture is Gothic Provencal, recalling the Palais des Papes in Avignon. 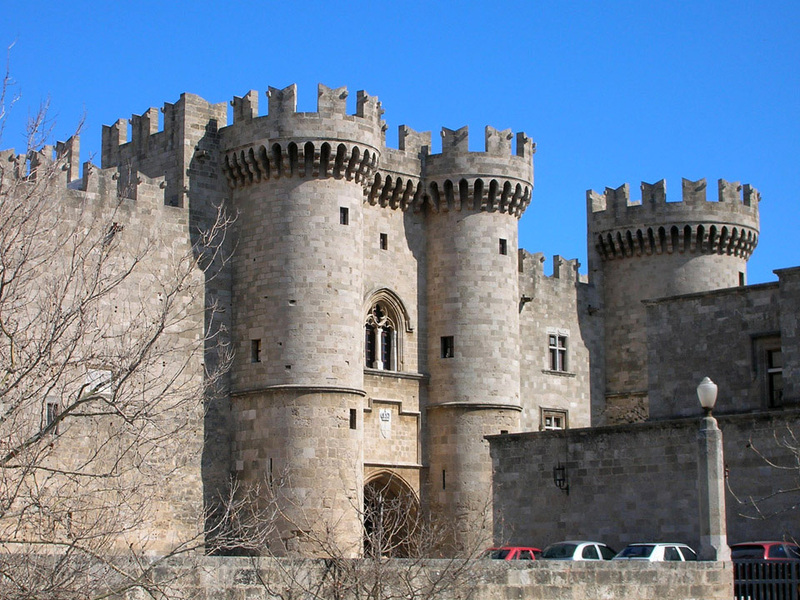 Rectangular fortress 75 m 80 m, even within the citadel(Collachium), it in fact includes ditches, a crenellated wall and lined with square towers and a dungeon. 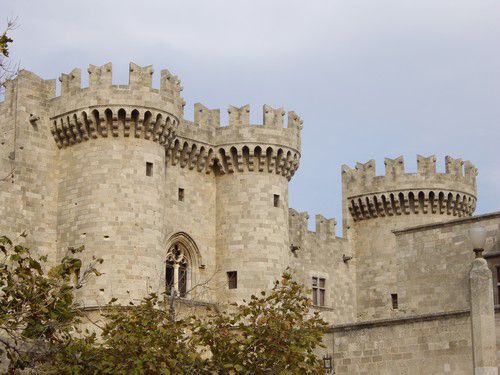 The fortress must have presented a massive and impressive. 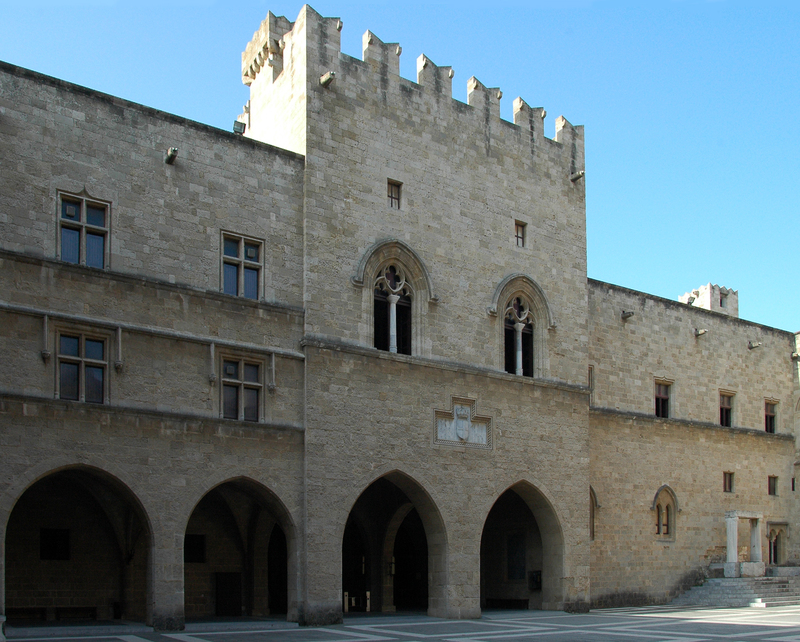 In the palace were also three floors of stores where food was stored and ammunition, making it a fortress capable of withstanding many seats. 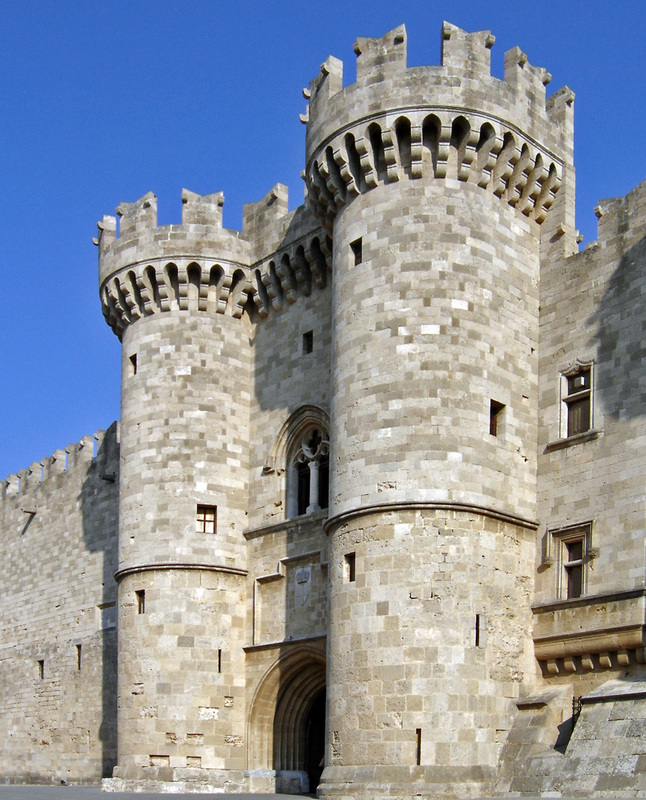 The main entrance is located in the southern part of the site Kleovoulou up the Street of the Knights . 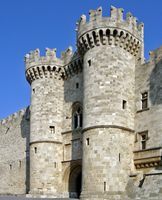 This majestic entrance is flanked by two semicircular towers (in the form of a horseshoe), crenellated battlements and, similar to the Sea Gate . 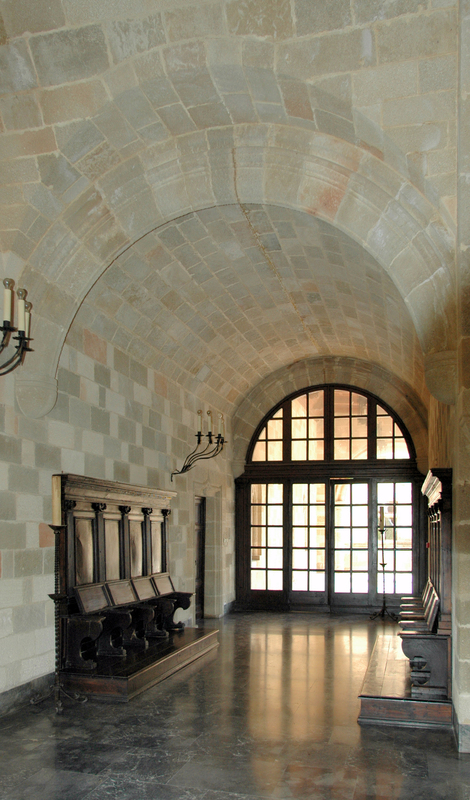 Admission provides access to a large hall. 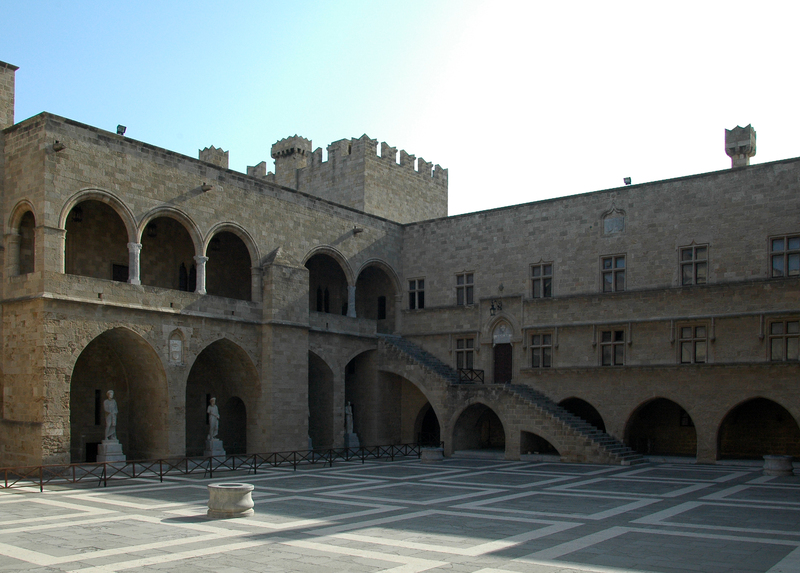 The Palace of the Knights is arranged around a courtyard with arcades. 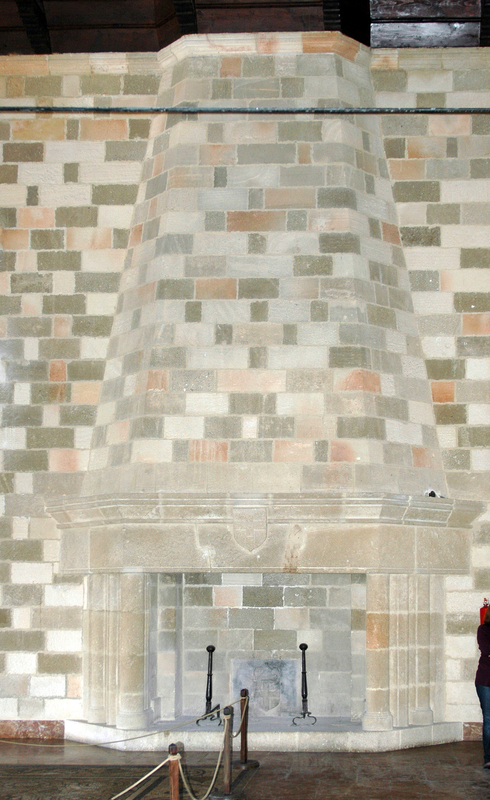 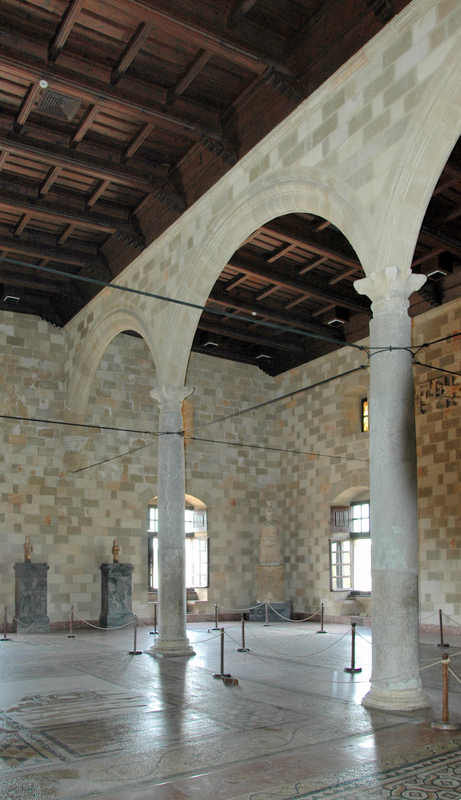 This courtyard 50 m long and 40 m wide is decorated with geometric flooring-tiles of marble and is bordered in the north by ten silos that allowed to supply defenders with grain during the sieges. 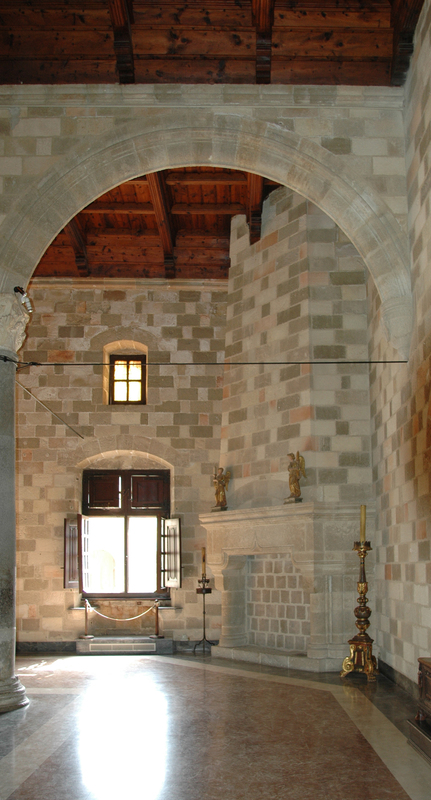 These niches today contain statues of Roman emperors from excavations carried out by the Italians in the early twentieth century, the Odeon of Kos. 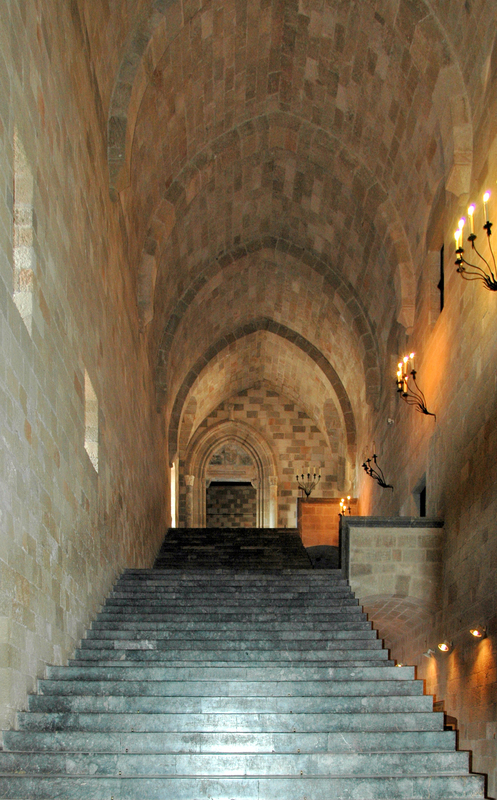 An external staircase leads to the east to the north of the loggia floor. 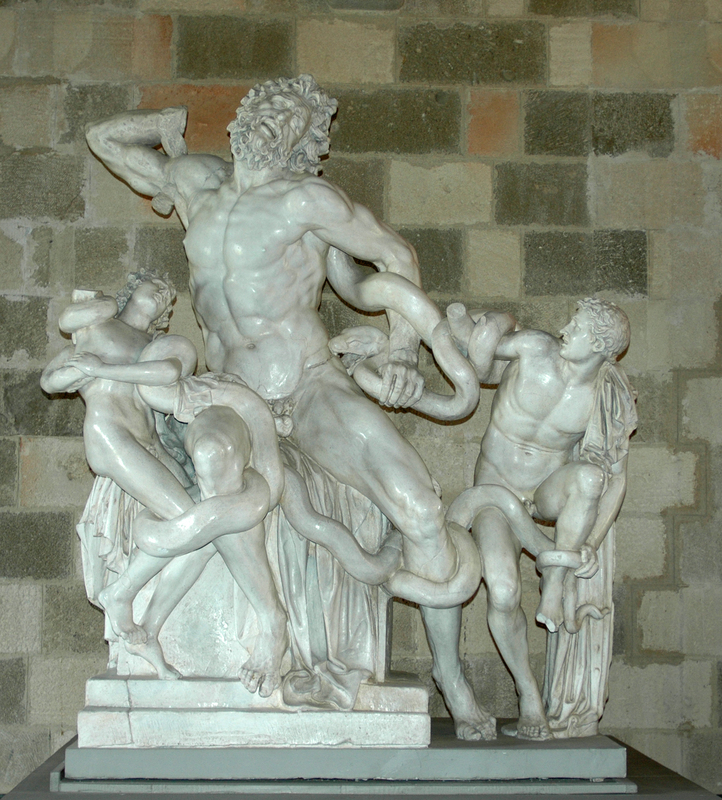 It can be seen overlooking the lobby, casting the magnificent statue of Laocoon, a masterpiece of sculpture Rhodian: it commemorates the death of the Trojan Laocoon and his son, and Antiphantes Thymbraeus strangled by sea serpents, and represents the anguish of the human face of uncontrollable forces of nature. 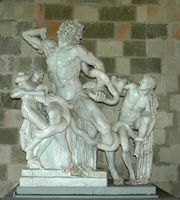 The original of this statue of the first century BC is the Vatican in Rome. 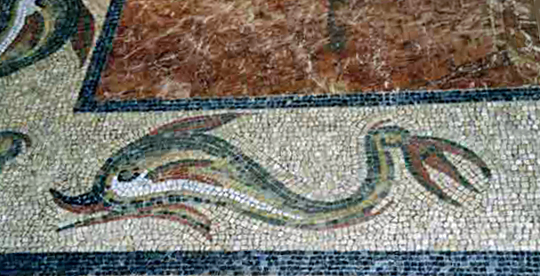 "Equo not credited, Teucri / Quidquid id est, timeo Danaos et dona ferentes." 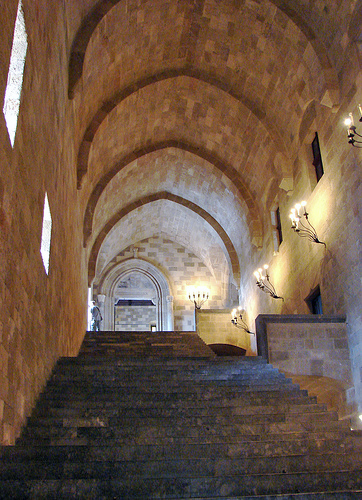 In the great hall, a staircase leads upstairs where we visit a series of large rooms. 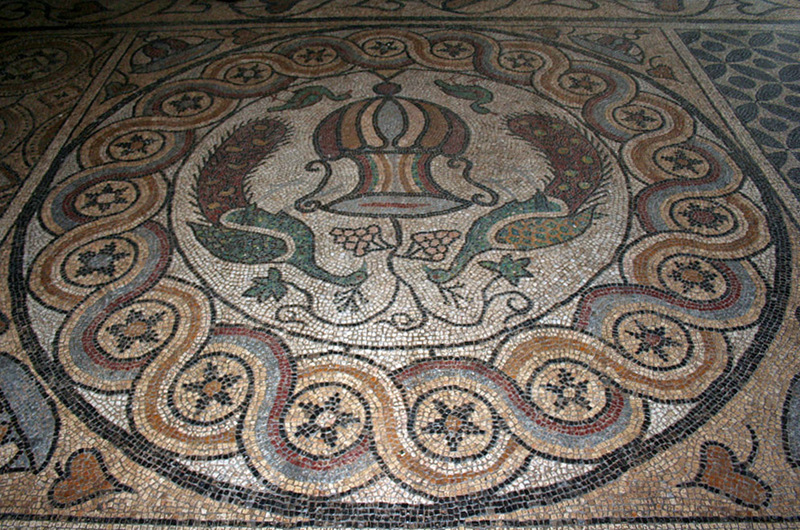 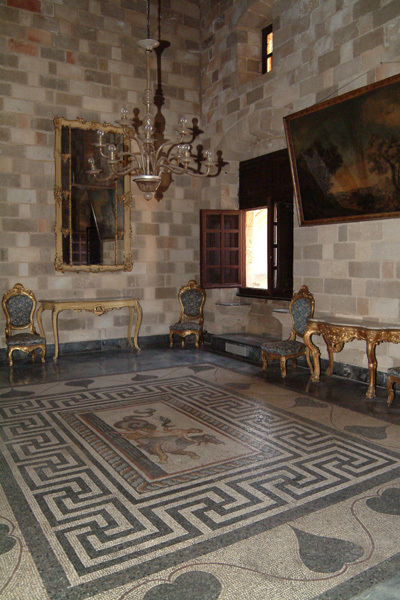 Rooms upstairs, decorated with Italian furniture, home to a series of mosaics period Hellenistic and Byzantine from the islands Dodecanese : notice hunting deer. 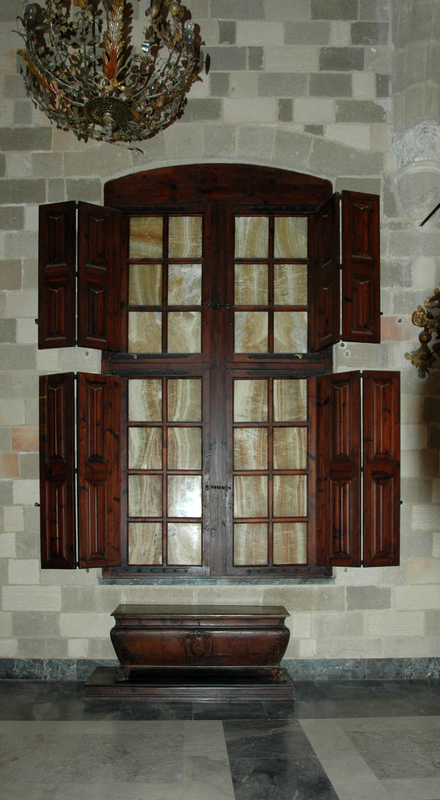 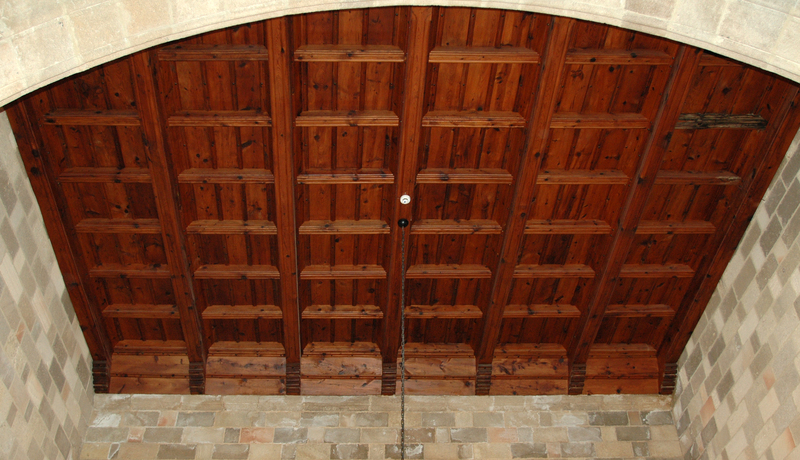 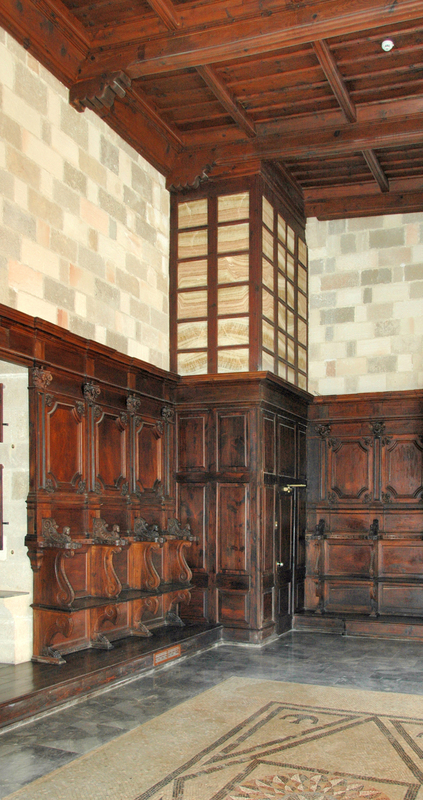 A collection of furniture western style of the sixteenth century and the seventeenth century is also presented. 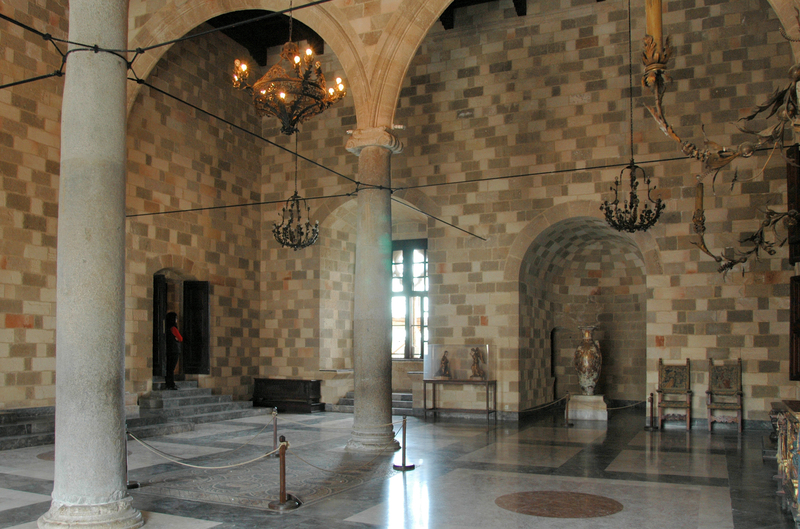 Inside, the room contains a nine Muses mosaic Hellenistic busts representing the nine Muses. 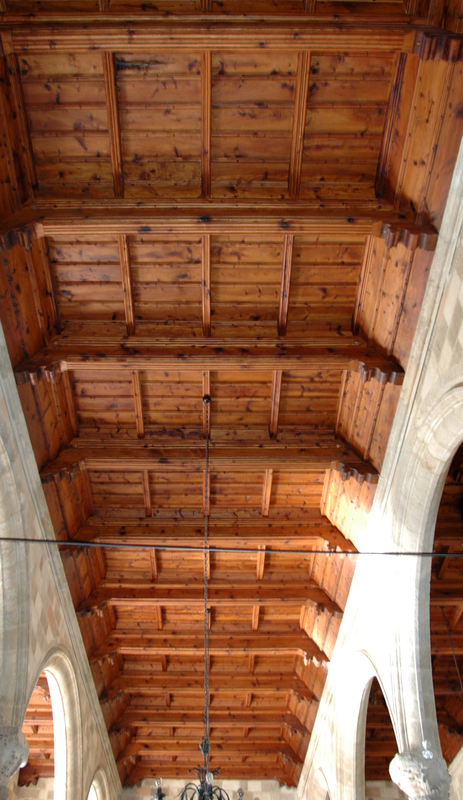 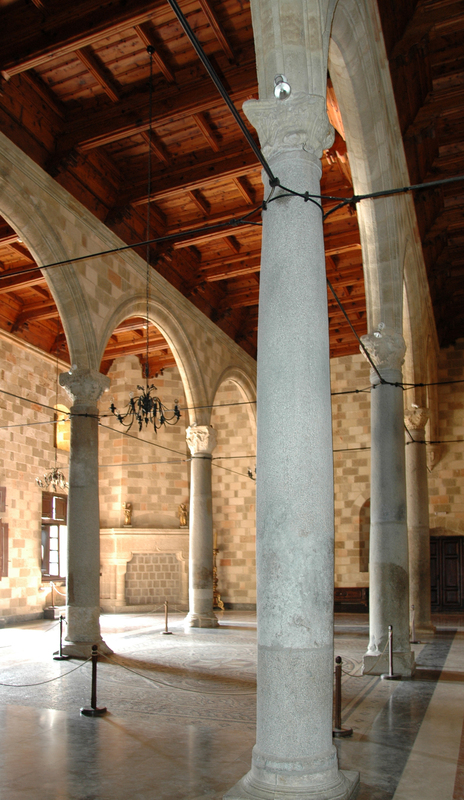 The colonnaded hall, whose ceiling is supported by two large arches in two columns, served perhaps room deliberations of the College Council and contains beautiful mosaics of the fifth century. 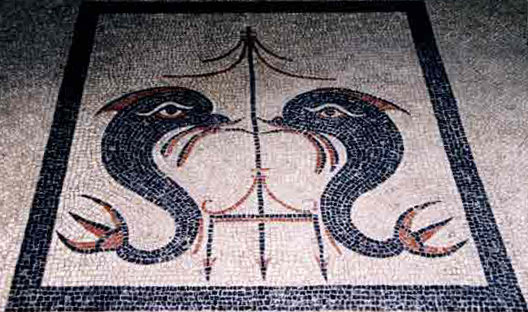 The bathroom features a mosaic of Medusa at the end of the Hellenistic period representing the mythological Medusa with her hair of snakes. 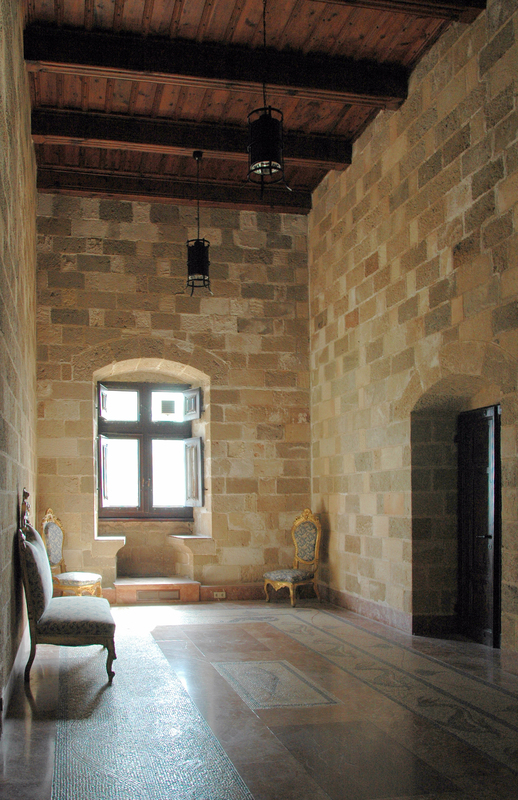 Islamic and Chinese vases are also included in this room. 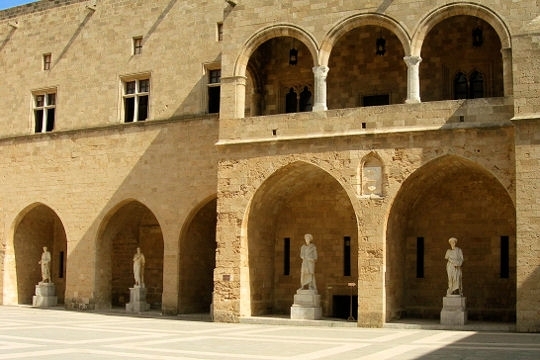 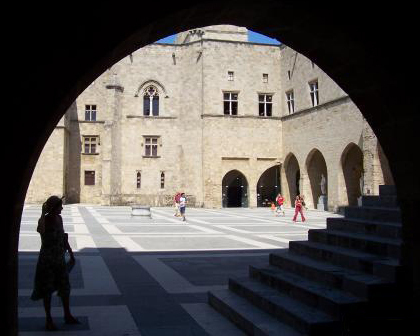 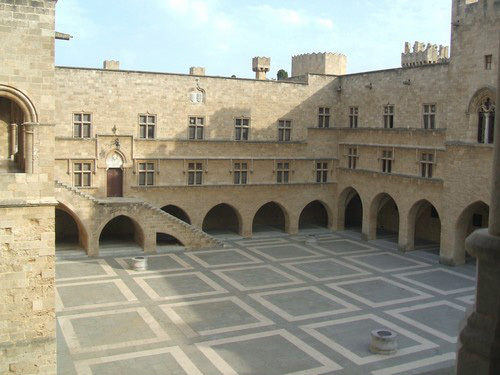 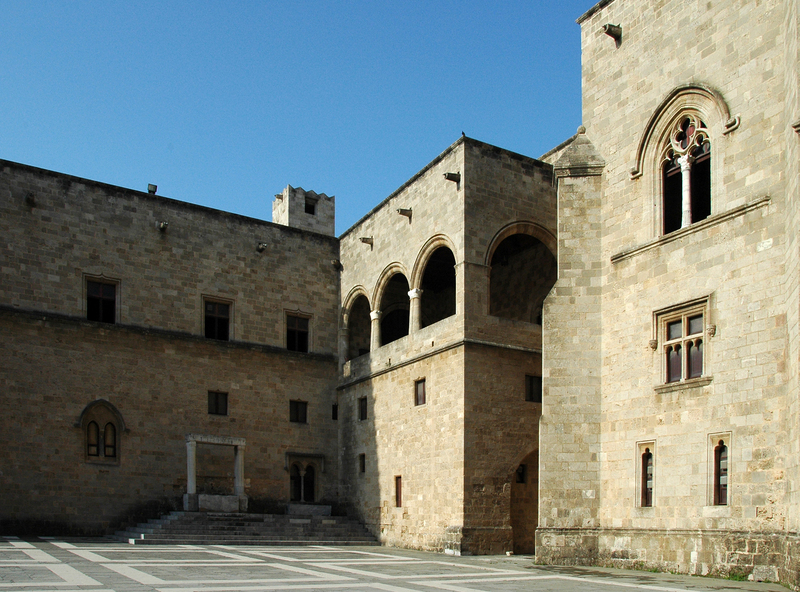 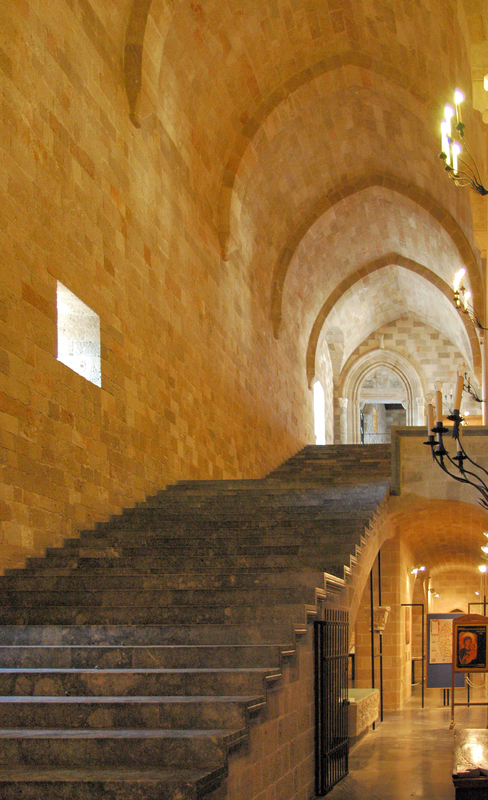 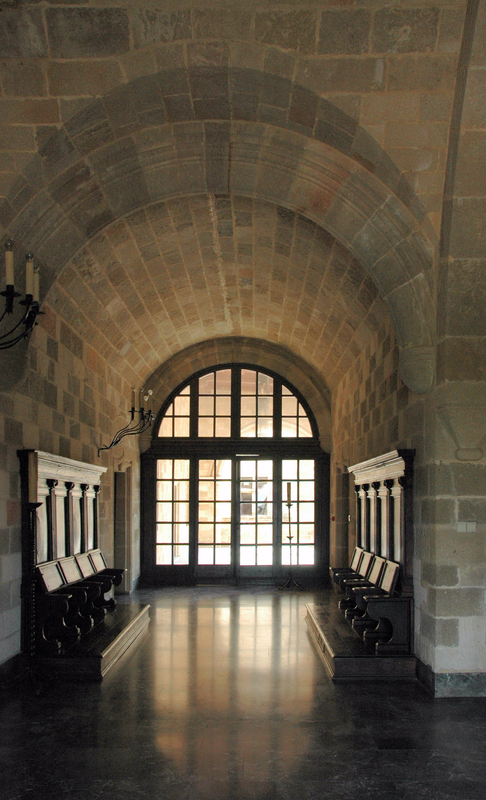 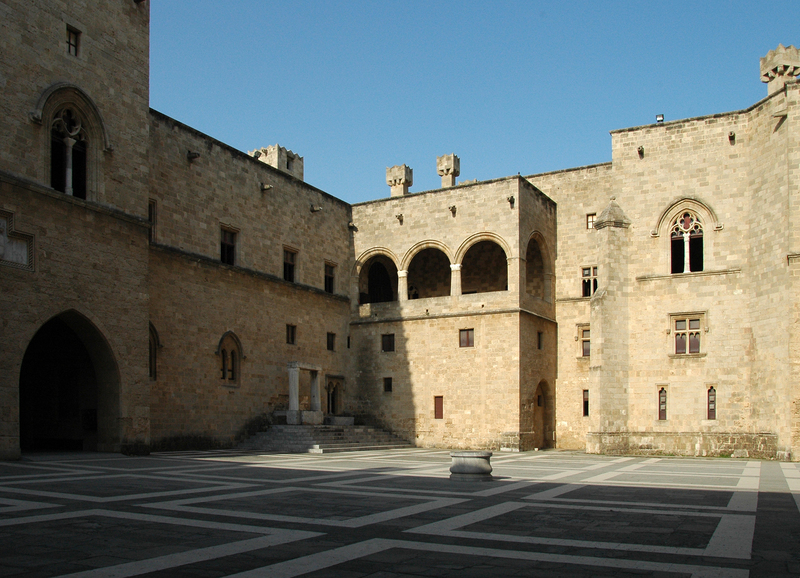 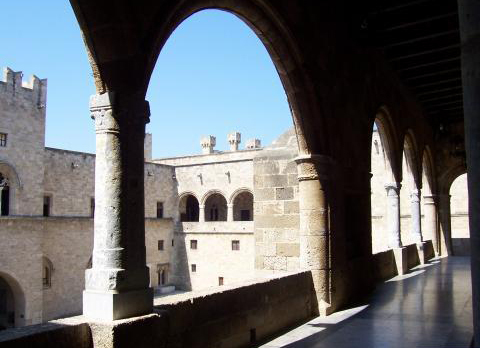 Two exhibitions are presented in the Palace: the first devoted to Ancient Rhodes brings together an impressive collection of archaeological and after the second medieval Rhodes , takes you in daily life in the Middle Ages. 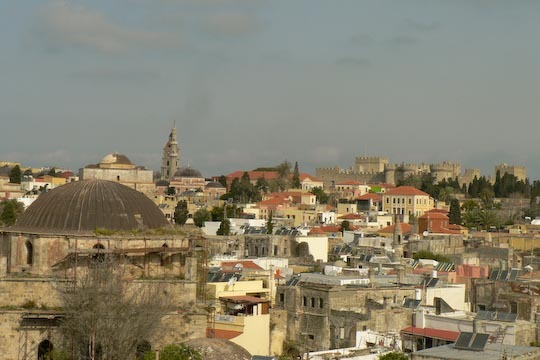 The palace was built in the late seventh century by the Byzantines as a stronghold of the city on the site of an ancient temple dedicated to Helios, the sun god. 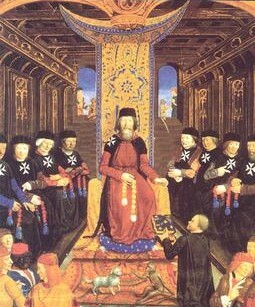 The building will be modified over time to the Knights of St. John in the home makes the Grand Master of the Order (from 1309). The Palace of the Grand Master seems to have been completed in its first form Helion de Villeneuve, but, like so many buildings on the island, it was enlarged and modified by Pierre d’Aubusson and Fabrizio del Carretto. 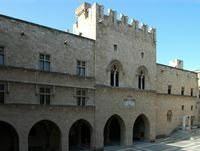 The palace visible today is the reconstruction by the Italian fascists of the palace built in the fourteenth century by the Grand Master Helion de Villeneuve . 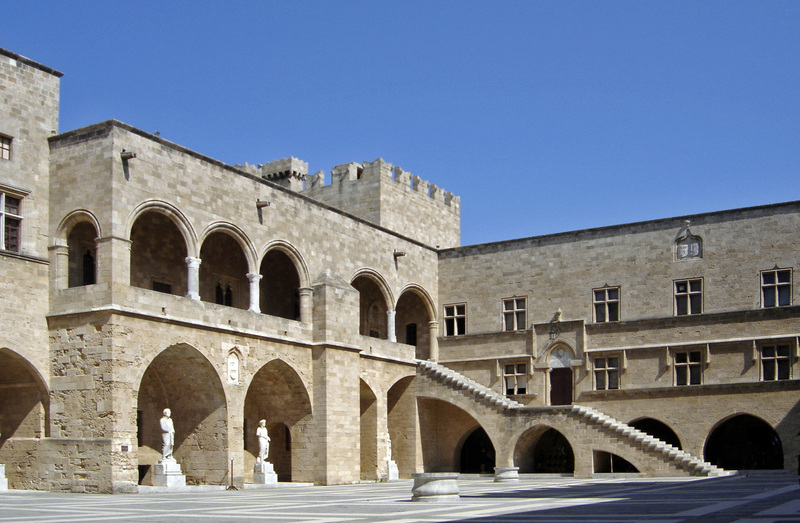 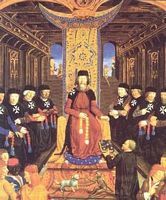 The Palace was the residence of the Grand Master of the Knights Hospitallers of St. John of Jerusalem and the administrative and political center of their State from 1309 to 1522, before being expelled by the Ottomans and move its headquarters to Malta. 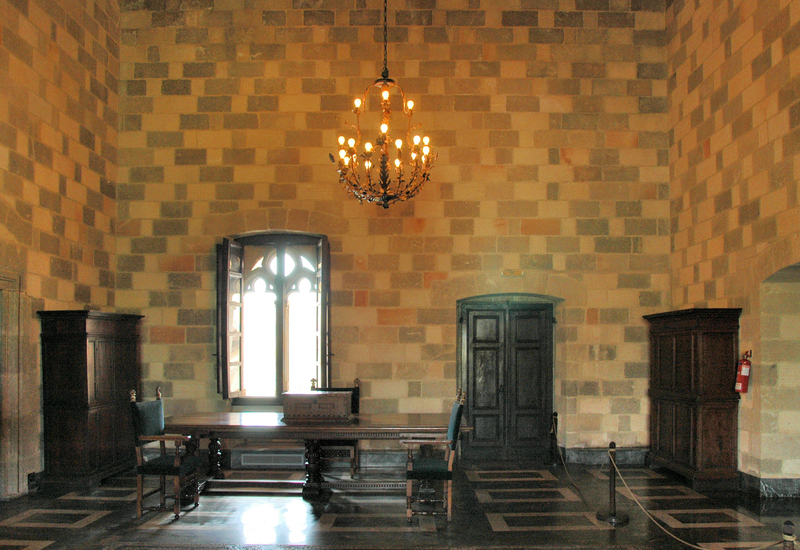 It is here that served 19 Grand Masters. The palace also acted as the last refuge for the population in case of danger, and could withstand a long siege thanks to its shops filled with food and ammunition. 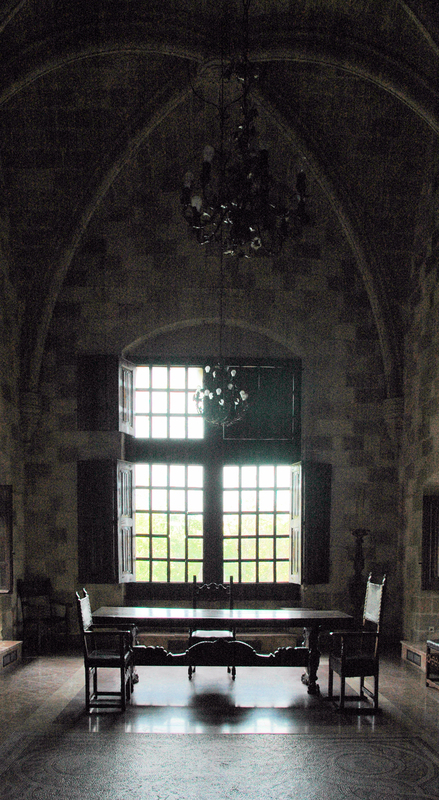 After the conquest of the island by the Ottoman Empire (1522), the Palais was transformed by the Turks in the warehouse, in prison and home for the guards. 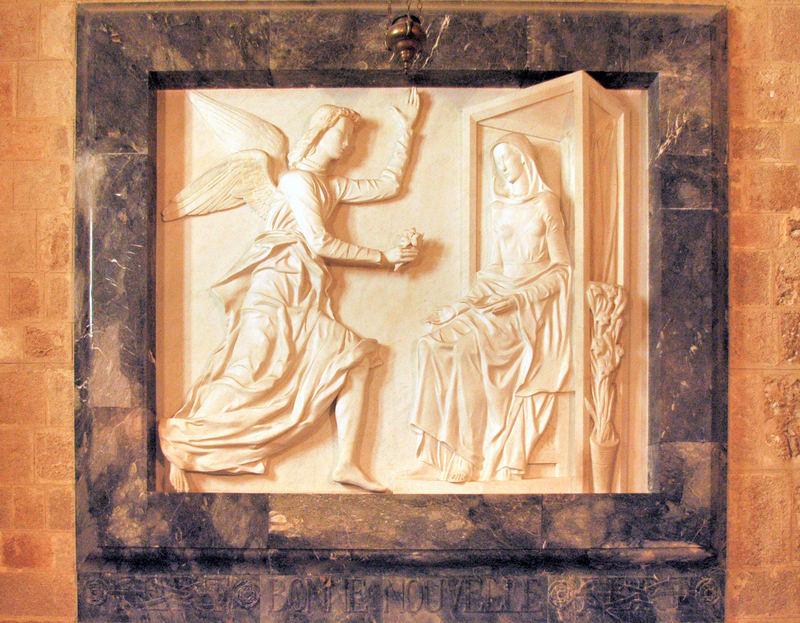 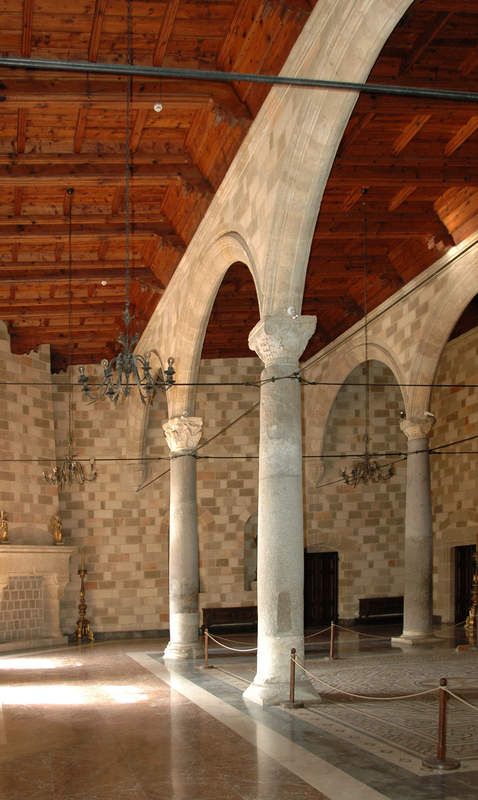 November 6, 1856, he was almost completely destroyed by the explosion of a powder magazine (forgotten in the basement by the Turks of the garrison) was struck by lightning, the church of St. John the Baptist (then transformed in main mosque), where were the tombs of the great masters, was also destroyed, remaining only a square tower whose clock stopped abruptly marked the time of the disaster. 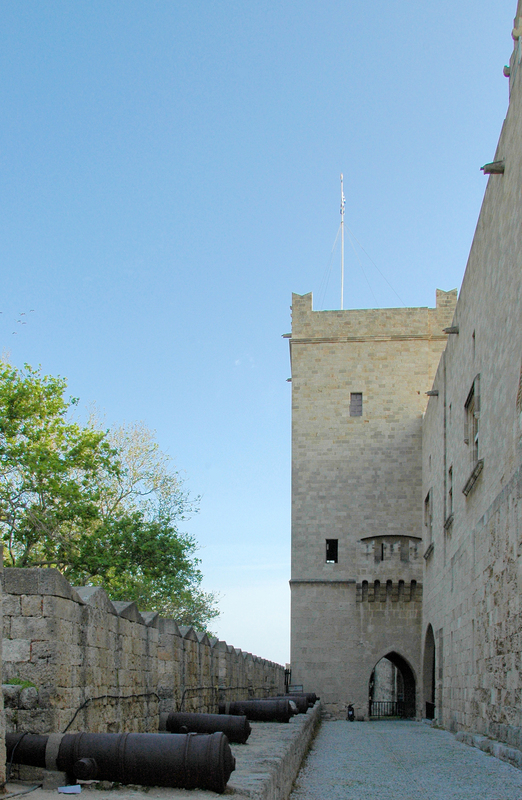 Stones were thrown all over the city and the sea beyond to the Tour St. Michael . 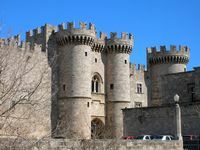 In 1937, Benito Mussolini wishing restore some grandeur to the city of Rhodes , Governor Cesare Maria De Vecchi Italian began to rebuild the Palace of the Grand Masters to transform into a summer residence for the use of officers of the Fascist Italy and the King of Italy, Victor Emmanuel III. 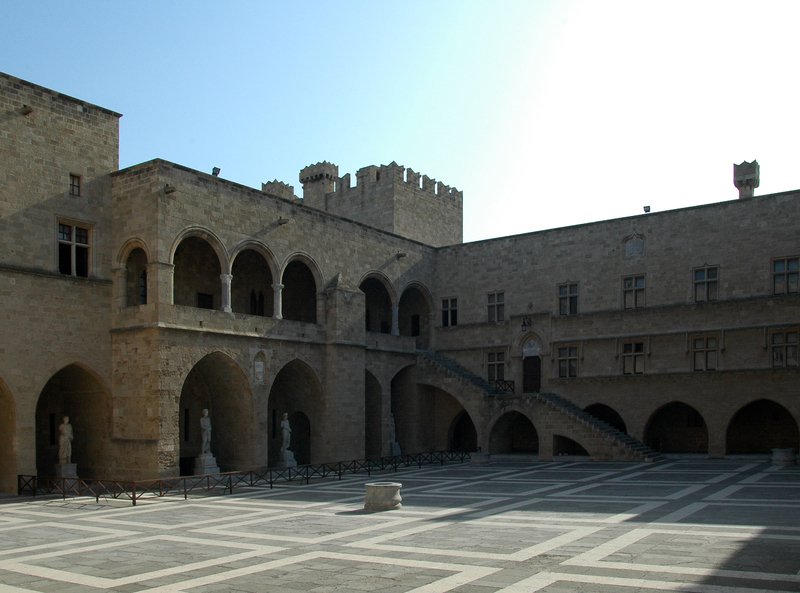 The exterior was rebuilt with great care scholars, inside with the desire to demonstrate the splendor fascist ironically became the palace is a monument to the Italian occupation rather than a memorial of its original builders. 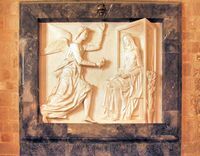 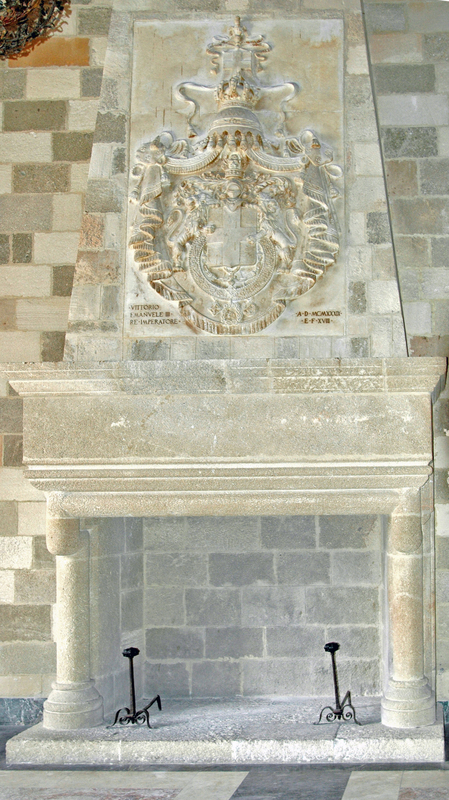 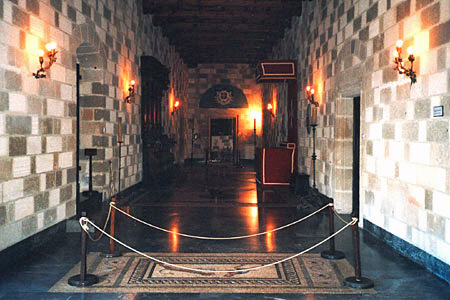 The Greek authorities have left prominently at the entrance to the palace of the Knights, a beautiful marble plaque stating the conditions of restoration of the palace under the auspices of King Victor Emmanuel III, "Emperor of Ethiopia" and the "Duce" Benito Mussolini. 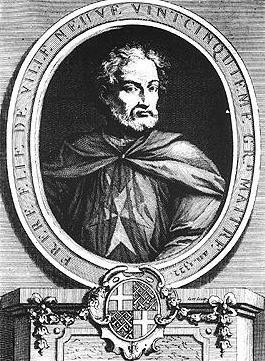 Cesare De Vecchi had put his arms on the Palais. 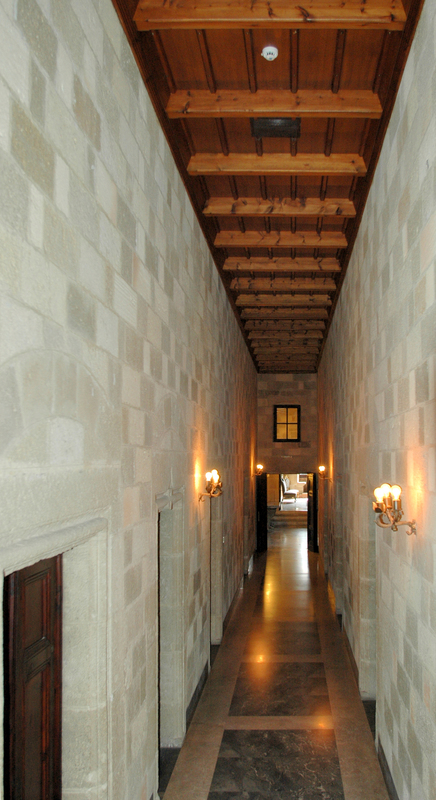 Restoration, according to the original plans miraculously preserved, was completed in 1939 and remains in the mood for Italian time. 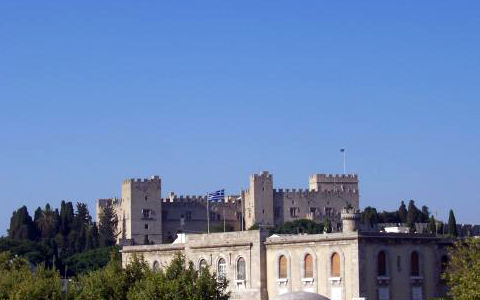 The Palace of the Grand Masters is the third most visited monument Greek. 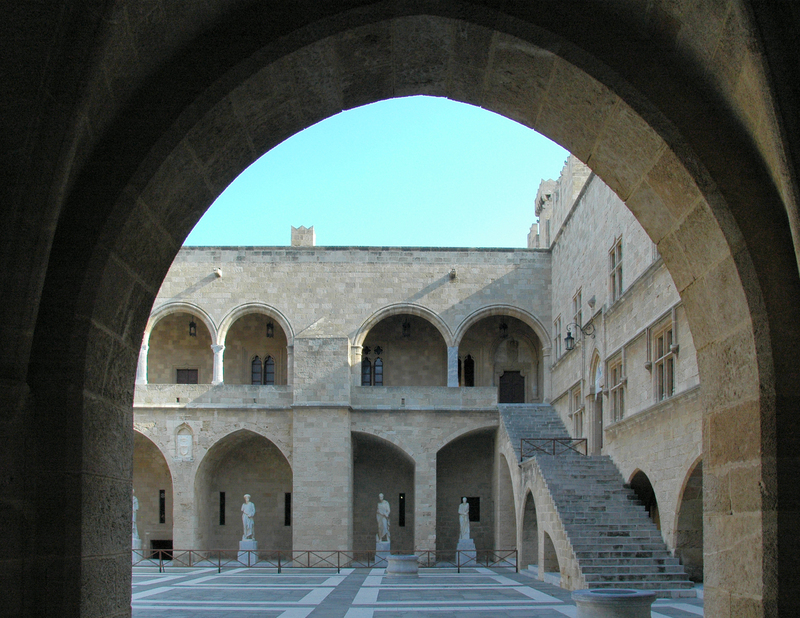 The Grand Master’s Palace is open every day except Monday, from 8 h 30 to 19 h 30 from August to September and 8 h 30-14 h 30 October to July. 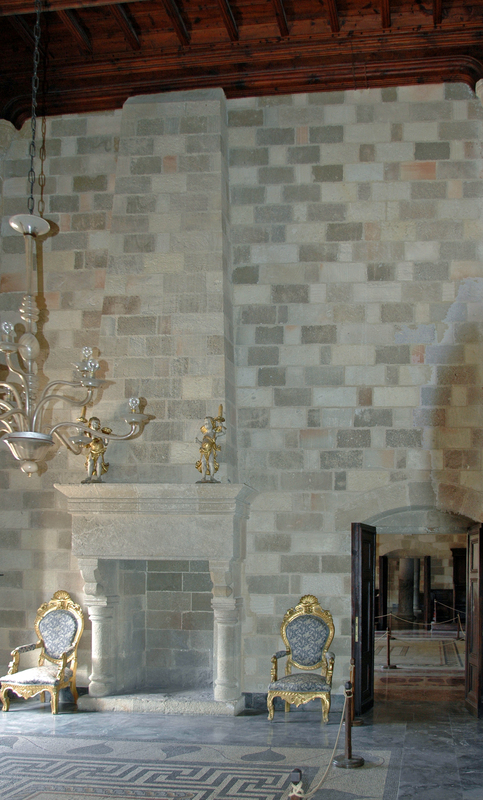 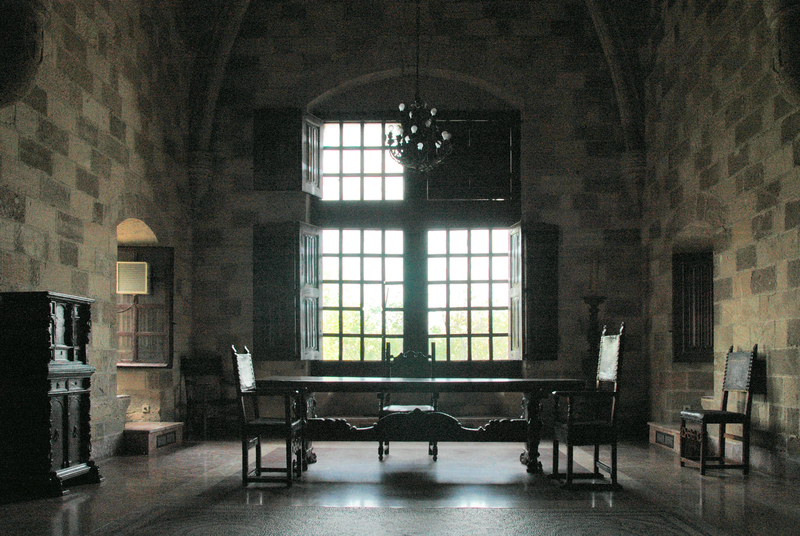 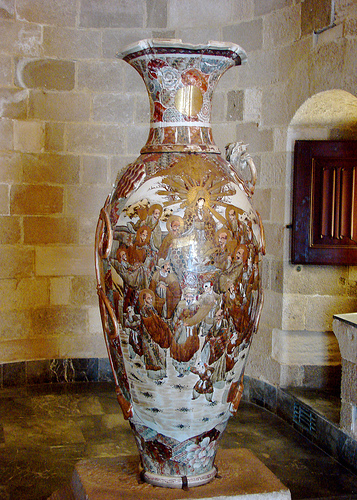 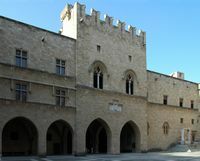 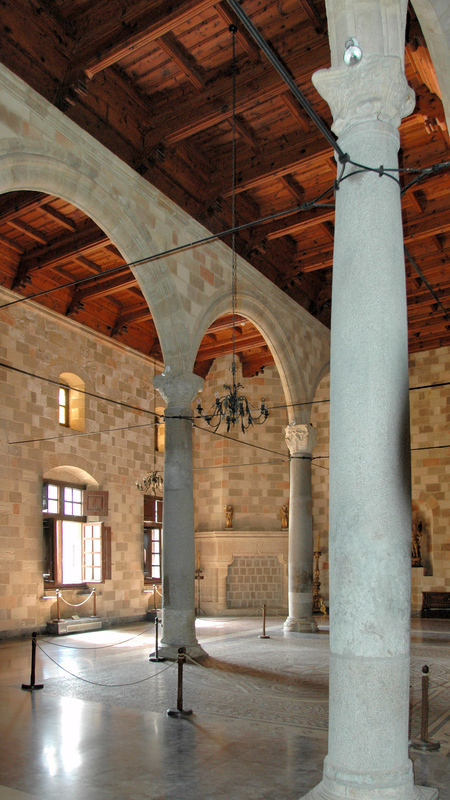 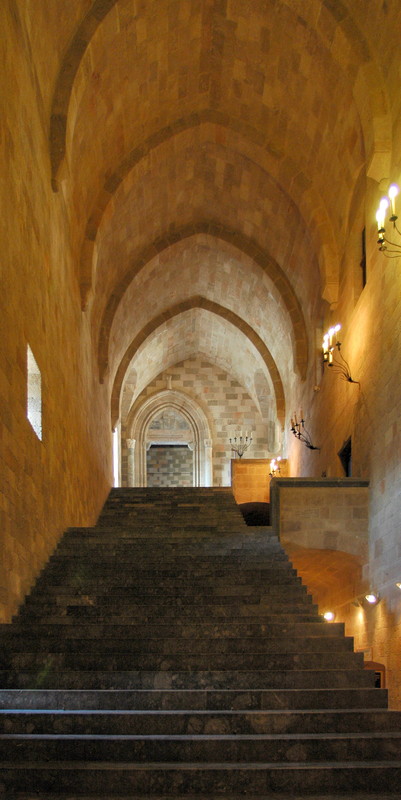 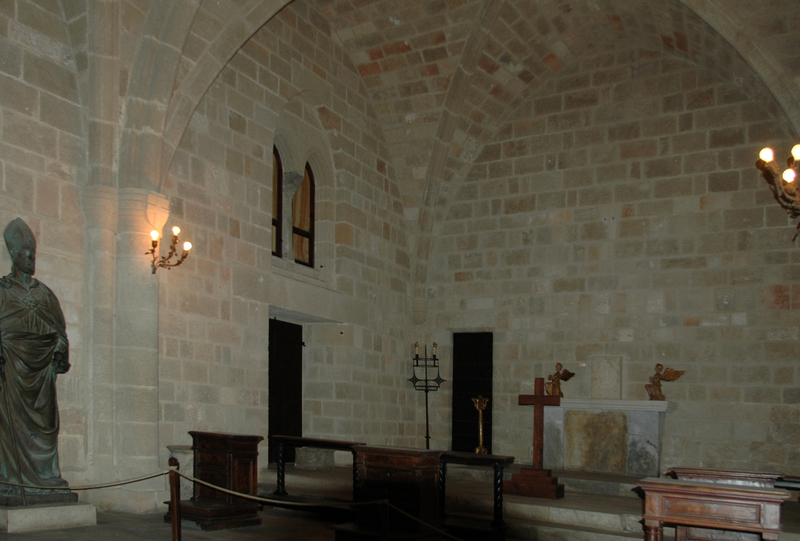 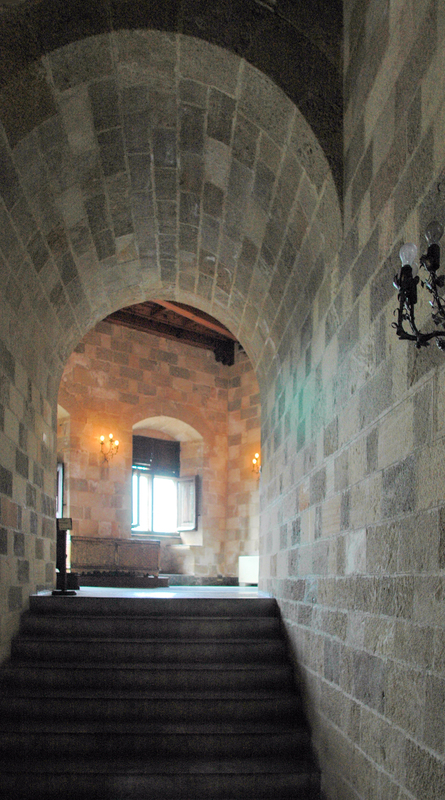 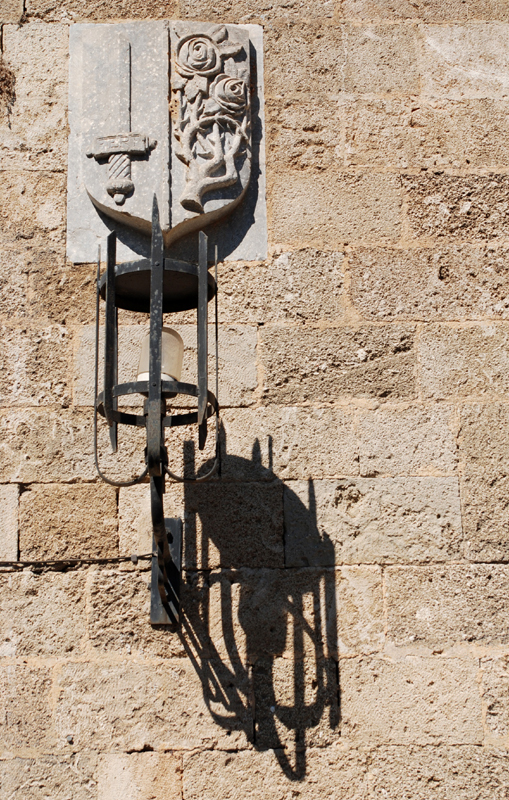 A section of the museum is devoted to the city of Rhodes in the Middle Ages, but it is only open between 12 h 30 and 14 h 30. 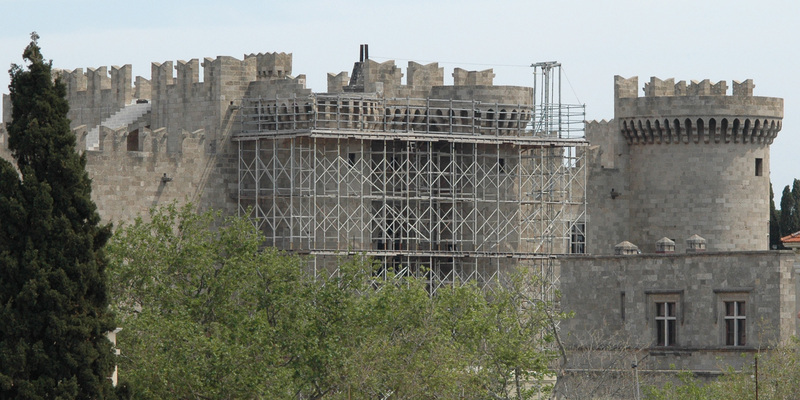 Following the collapse of part of the battlements in 2008, the main entrance is being repaired; visits entry is on the left of the palace near the Gate of the Canons.